I feel like this week has flown by. My parents were here over the weekend, and now, it’s Thursday already! With the cooler weather, Jasper has been so cuddly, chirpy, and playful. I love this time of year, and apparently so does Jasper! I made my grandma’s famous Macaroni Corn Casserole Sunday night, and have been noming on the left overs all week. She always made it for holidays when I was growing up, and I liked it, but it was never my favorite… but over the last few years, I’ve just LOVED it, and was craving it a few weeks ago, so I made it for the first time! We also grilled steaks on the George Foreman. Delicious little meal! Melt margarine, and mix with remaining ingredients. Pour into 2 quart casserole dish, and bake, covered for 30 minutes at 350 degrees, then stir, and bake uncovered for an additional 30 minutes. Serves 6-8. This week, I found the best tacos ever. The. Best. Tacos. Ever. EVER! A little hole in the wall mexican/burger/gyro place near where I work called Burger To Go and/or Cancun Fiesta Fresh, in downtown KCK. Not really sure what it’s called, since there are 2 signs. For those of you who are in or around KC, it’s at the corner of 7th St. Trafficway and Central. They sell burritos and tacos, burgers, gyros, and other random food. I tried the taco, and OH my gosh, amazing. Also this week, my new Altra Running shoes came, and I took them out for a quick mile on Monday! I will do a review of the Altra Torin’s once I’ve run in them a bit more. The zero-drop philosophy and foot shaped toe box has intrigued me for a while, I’d heard good things about Altra. A couple weeks ago I had the chance to try a pair of Altra Paradigm’s at the KCRC Groupies run, and definitely felt a difference from my Saucony Kinvara’s. I researched more about Altra Running online and decided to try a pair of Torin’s, which have a little less cushioning than the Paradigm’s, but still have zero drop and the wider toe box. Check back soon for my review and comparison. Tonight at the KCRC Groupie run, we tested Garmin watches. I have a Garmin 210 (the white one), and love it, but was really excited for the opportunity to try the Garmin 620 (the black one). It was really cool and had lots of techy features. It was probably a bad thing that I tried it, because now I want one! Tonight was also my 4th run in my new Altra’s, and I’m really enjoying them so far! My September Run Streak is almost over, tonight’s run put me at 25 days in a row of at least a mile, and I’m over 60 miles for this month, which puts me higher than the last couple months. Have you ever drastically switched running shoes, or switched brands? 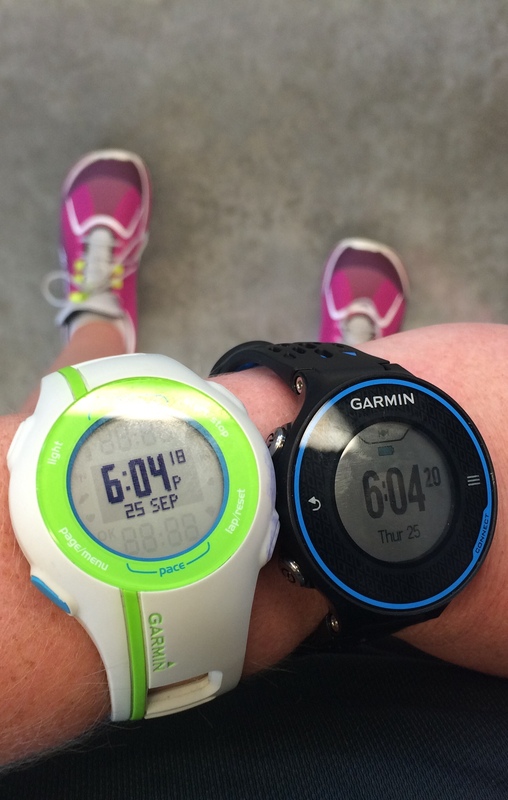 Do you use a running watch? Do you love all the techy features and get reeked out like me? Have a great weekend! This entry was posted in Ramblings and tagged Altra, Altra Running, Casserole, fall weather, Garmin, Garmin 210, Garmin 620, GPS watch, KCK Tacos, kcrc, Recipe, running, running watch, shoe comparison, Street Tacos, Tacos, Thursday Thoughts, Torin, Zero Drop. Bookmark the permalink. I used to run in Brooks Glycerins for a long time, but I developed an ankle ache and worried I needed more padding. So I switched to Hoka Bondis. The ache went away and has been gone for nearly a year. The Hokas are great for me, but the insole on my right foot won’t stay in place. It slides up behind my heel when I’m running. My newest pair has less than 200 miles on them, and I got 600+ out of my last pair. But when the time comes, I may consider the Altras. I wear a Nike+ Sportwatch. It’s pretty basic: pace, distance, heart rate (don’t use). For my level of running, it’s fine, but I understand Nike will no longer make them (they’re going to concentrate on phone apps), so when the time comes for a new watch I’m considering the Garmin Forerunner 15. Also entry level, but probably all that I need. I’ve run in Saucony Kinvaras for over 18 months, had a pair of Brooks way back. I’ve felt like my Saucony’s just don’t have the support I need, but I kept buying more because it was what I knew. I hope to do a thorough review of my Altras within the next few weeks. Hopefully you will find the perfect shoe too! I love the techy features of the Garmins! I have the 210, and have had it over a year and a half with no problems. I’m sure I’ll get another Garmin someday when this one dies. I don’t need a lot in a watch, I don’t use a heart rate strap, but I do use the foot pod to track distance and cadence inside, which has been a nice feature.